Ruth Berger was afraid of ghosts. For many years, she refused to acknowledge their presence - resisted their presence - even though she had long known of her psychic abilities and made her living as a standup psychic and medical intuitive. When ghosts started to interrupt her shows to give her messages, Ruth finally realized that it was time for her to acknowledge them. She discovered she could use her rare ability to speak to the loved ones of those who had passed on. Berger tells us there are two main reasons why ghosts contact the living. The living need them. Or the dead need the living to do something. Berger shares actual stories of her conversations with ghosts and how she used those episodes to help the living and the dead. Meet Ellen, a hospitalized 11-year-old whose dead grandfather comforted her after she was abused. And Mary, whose husband contacted Ruth from the grave to prevent their daughter's suicide. With her no-nonsense style, down-to-earth stories, and helpful hints, Berger demonstrates how almost anyone can learn to listen to the voices that might be trying to reach them from beyond. Each chapter provides steps to "see what I see" to develop channeling abilities. 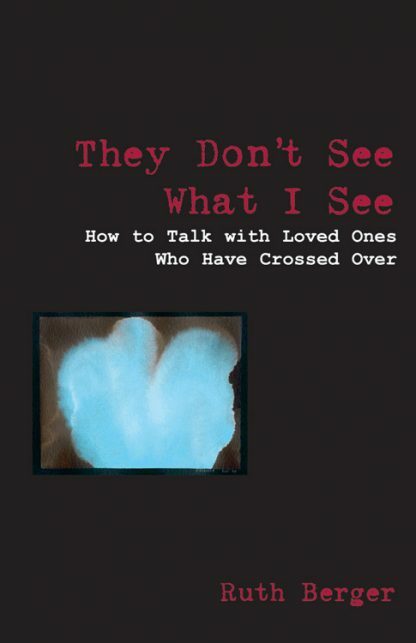 They Don't See What I See also includes tips to prepare for channeling and methods to use while channeling to avoid contacting evil spirits.